When my family moved from South Carolina to the Mid-West, we expected things to be a bit different. One of the biggest changes—the weather! During the winter, I cringed the first time I saw a forecast high temperature in the single digits (How can the high be 9 degrees?)! Then as spring turned into summer, a new pattern developed. My son started feeling more and more anxious about thunderstorms. He’d certainly seen lightning and heard the rumble of thunder before, but severe weather is a bit more intense, and more frequent, in our new home. 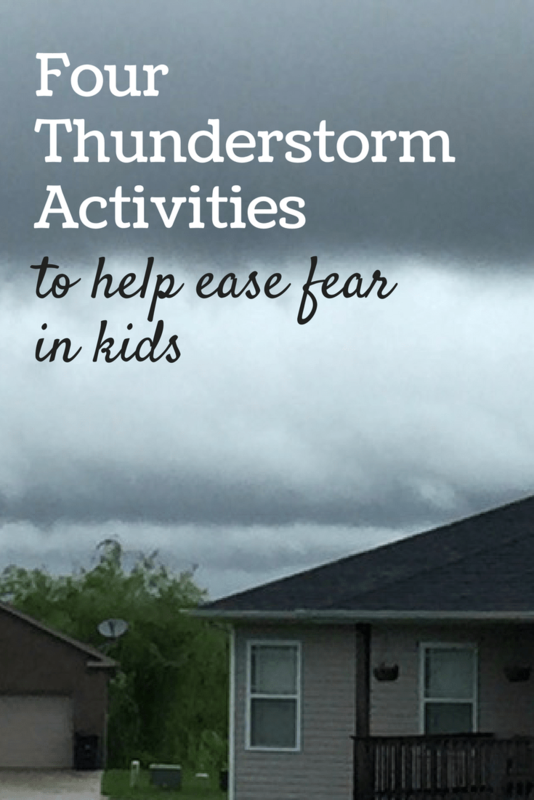 Based on the idea that knowledge is power, I set out to find some kid-friendly thunderstorm activities that would teach our whole family about what was happening and how to feel less afraid. Indoor Thunderstorm. First, we tried to create our own indoor thunderstorm, using the experiment detailed at Learn Play Imagine. This one is colorful and fun to watch. One piece of advice: make sure your plastic container doesn’t have any cracks! The first time we tried this, we ended up with a flood on our table instead of a thunderstorm. Lightening in Your Mouth. Next we checked out some of the great resources at Weather Wiz Kids, which is run by a meteorologist. It has all kinds of weather facts and experiments, including how to make lightning in your mouth. It’s safer than it sounds! Build a Family Emergency Plan. Having a plan in place can go a long way toward making a child feel secure. The government website Ready.gov has a section dedicated to severe weather. You can learn about the types of hazardous weather that impact where you live, then you and your children can build your own family emergency plan together. Weather Sensory Bin. While it’s never safe to go outside during a thunderstorm, your kids can get hands-on with the weather using a weather sensory bin like the one described at Fun-A-Day. We added clear glass beads as hail stones. Tools to Help Ease Fear. Offering a few stress relieving tools will help as well. The links are affiliate links. Journal for recording feelings in the moment. While my son is still nervous when he hears storms are in the forecast, he’s also learning about the science inside the storm. I’m hoping that insight and continued conversations will help overshadow the fear, and we can all breathe easier the next time dark clouds appear on the horizon.